The second round of the Czech presidential elections, held on 26-27 January, ended in the incumbent’s (narrow) victory. By Leon Podkaminer and Peter Havlik. Miloš Zeman, notorious for his rather crude language, prevailed over Professor Drahoš, a well-mannered, if fairly bland, Prague intellectual. The majority of the Czechs continue to prefer ‘someone like us’ to a representative of the elite. That is not quite new. Václav Havel, the first President of the Czech Republic, a truly towering moral and intellectual personality, has long since been viewed with reservation, if not a dose of contempt, by the popular opinion. But his successor (and Mr Zeman’s predecessor), Václav Klaus, ‘renowned’ for plain language (and questionable political deeds), still enjoys underserved popularity. Symbolically, ‘the Czech countryside beer saloon’ is still valued more than ‘the Prague coffee house’. In normal circumstances, Mr Zeman’s staying in office would be quite inconsequential. His open admiration for Vladimir Putin and his open Islamophobia (otherwise shared by the majority of Czechs) would not matter much at all. But the current Czech politics is not normal. Andrej Babiš, whom Mr Zeman designated for the office of Prime Minister, does not have a parliamentary majority. Moreover, Mr Babiš has been implicated in a corruption scandal that might lead to his conviction. However, as long as Mr Babiš is shielded by the President, he can keep his office and effectively run the country. Would Mr Zeman change his mind? That seems rather unlikely because the fall of Mr Babiš would necessitate early parliamentary elections with an outcome that is hard to predict. With the status quo, the President has a say on the policies of the government. That ‘say’ might be lost should the parliamentary elections bring forward a majority which would not have to be ‘grateful’ to the President. The Zeman-Babiš pact will give the government a free hand in economic and social matters. The orientation of the economic and social policies will remain unchanged. Given Mr Babiš’s personal background, one could perhaps expect a slightly more pro (domestic) business emphasis in matters of taxation and administrative regulation. Neither the Czech National Bank nor the new government are likely to change their sceptical stance on the issue of euro introduction. Also on other important European matters (e.g. on the readiness to accept large-scale quotas of migrants) the new government will remain uncooperative. 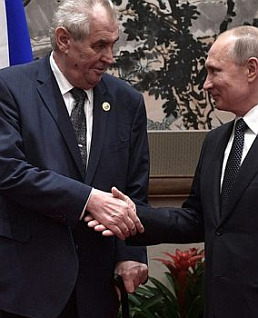 Photo: Miloš Zeman and Wladimir Putin; Russian President's government website.